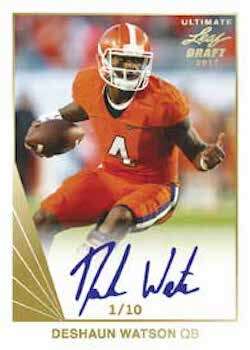 The throwback option in Leaf's pre-draft football arsenal, 2017 Leaf Ultimate Draft Football presents the top likely NFL draftees in 2017 alongside previous designs from the brand. Every box totals five on-card autographs. 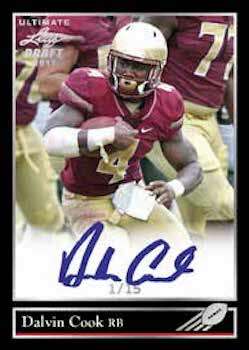 Utilizing popular designs of the past—like 1990 Leaf, 1991 Leaf Rookie and 1992 Leaf Black Gold—the 2017 Leaf Ultimate Draft Football Autograph checklist is filled with young stars and retro looks. 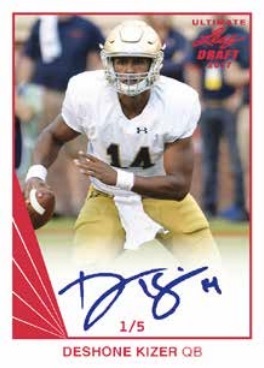 Led by the many hard-signed options, the one-pack box also offers a shot at low-numbered parallels. 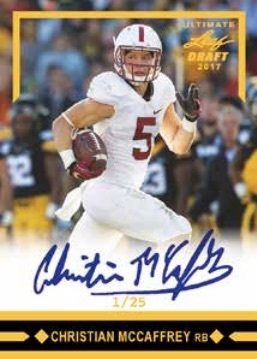 Among the key players in the 2017 Leaf Ultimate Draft Football release, Leaf teased signed cards for Christian McCaffrey (RB - Stanford), Corey Davis (WR - Western Michigan), Dalvin Cook (RB - Florida State), Deshaun Watson (QB - Clemson), DeShone Kizer (QB - Notre Dame), Mike Williams (WR - Clemson), and Mitch Trubisky (QB - University of North Carolina) on the formal solicitation. 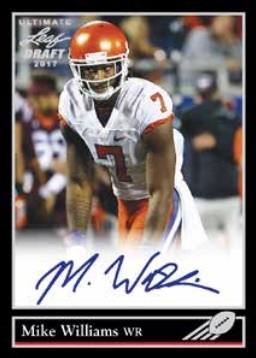 2017 Leaf Ultimate Draft Football is limited to only 200 numbered cases or 2,400 total boxes. This marks a decrease from 2016, which featured 300 cases. 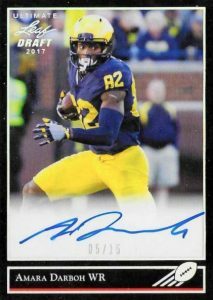 Shop for available 2017 Leaf Ultimate Draft Autographs on eBay. PARALLEL CARDS: Gold #/25, Silver Spectrum #/15, Gold Spectrum #/10, Red #/5, Purple 1/1, Printing Plates 1/1. PARALLEL CARDS: Gold #/50, Silver Spectrum #/25, Gold Spectrum #/10, Red #/5, Purple 1/1, Printing Plates 1/1. 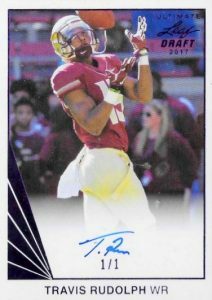 PARALLEL CARDS: Gold #/20, Silver Spectrum #/15, Gold Spectrum #/10, Red #/5, Purple 1/1, Printing Plates 1/1. 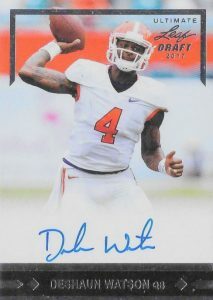 looks like the cards are out on Ebay — whats the deal here ? Opened my box last night and was super excited to see a purple 1/1 parallel card. But then I noticed one of the corners was scuffed up pretty bad. Since Leaf packages these in soft sleeves & toploaders themselves, I expected better. Big disappointment.